Expose all (well nearly!) in this sheer mesh men’s short. As the professional producer of underwear in China, we are convinced that the high quality determines the selling success. - Checking all the patterns. - Making a pre-production samples prior to the production. - All the goods are separated and shipped according the instructions of the clients. F: Can I put my logo on your underwear? Yes.we can accept the OEM order,as long as the logo you want is not copyrighted we can put it on our underwear,regarding the licensed products,we need get your license letter before production. We are the vendor of Disney and many world branded underwear.In addition,we have established stable supply relations with domestic and foreign large clothing chain stores. As a underwear manufacturer with over 13 year's experience, we always insist on the managing idea of "Quality First, Clients First", dedicated to the continuous enhancement of product quality and service standards. As a result, our underwear products have gained a good reputation in the world market including Europe, America, Middle East,Australia,Asia(japan,singapore,korea and Israel). We believe, on the basis of mutual benefits, we and our partners are sure of moving toward the brighter future in the coming cooperation. Thank you so much for your attention and patience! 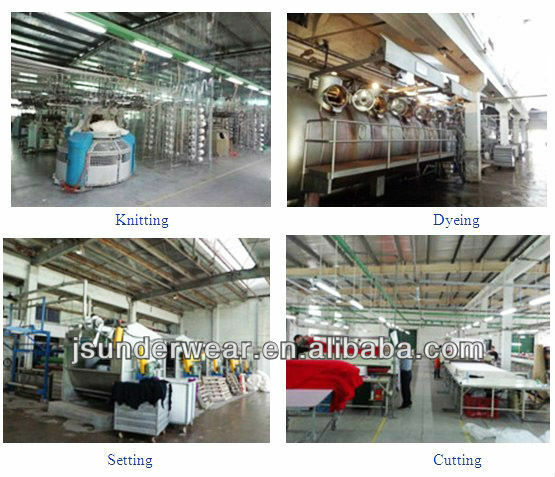 Jinjiang Jspeed Garment Co., Ltd.